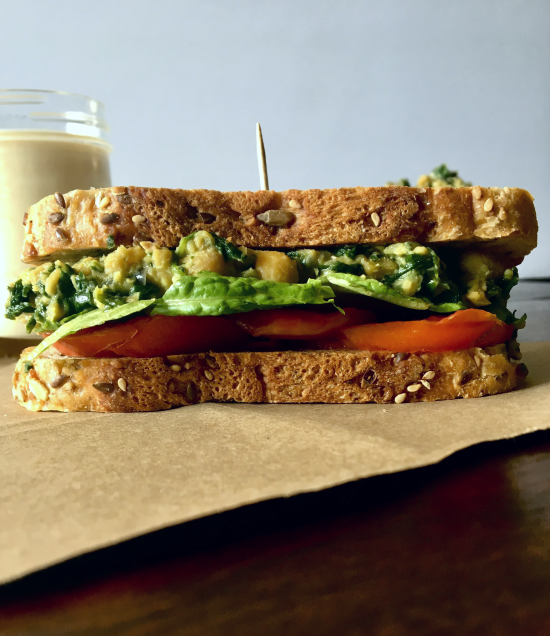 Creamy Chickpea Mash with Spinach - a healthy vegan sandwich for work or school! 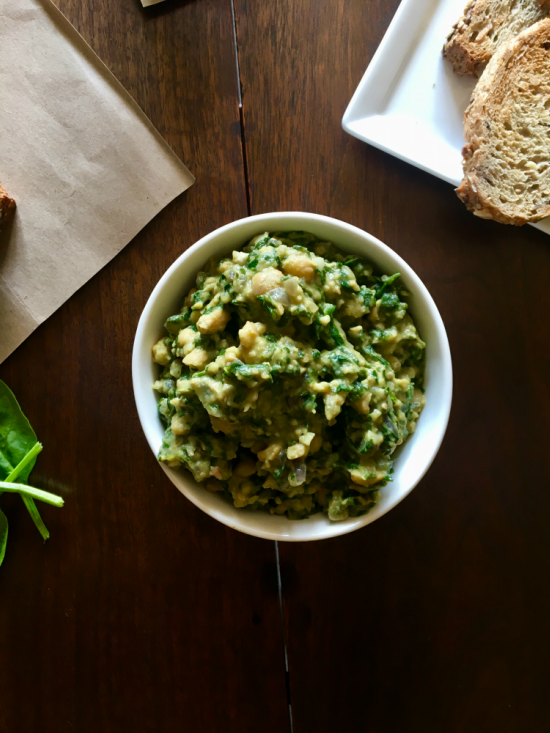 Today’s recipe was requested by one of our favorite Plant Power People – the wonderful Natasha – who gave us a Kale Chickpea Mash recipe from Veg Web to use as our inspiration. I must admit, as soon as I heard the word kale, everything in me told me to run the other way, but with back to school season right around the corner, I knew it was time to give this a go. My first instinct was obviously to drown this mash in vegan mayo…because I may have eaten a salad yesterday, but – come on – it’s still ME. But, I ended up opting for an approach that would add to the nutrients in this dish without sending my veggie-phobic self to the high heavens in search for fried seitan. 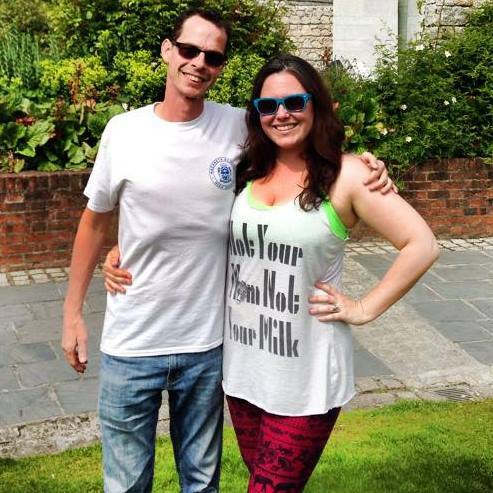 The answer, my friends? Avocado cream sauce. Oh. Yea. Now, I’m not a huge fan of avocados on their own, but oh buddy oh boy, when you blend one of those bad boys up with some liquid and seasonings, it creates the creamiest, most decadent sauce or spread you could ever imagine. And you don’t even need a fancy blender for this! We actually use our immersion blender in a mason jar, and that works great. And just like that, a recipe I had previously feared was transformed into something about which I can certainly get excited! 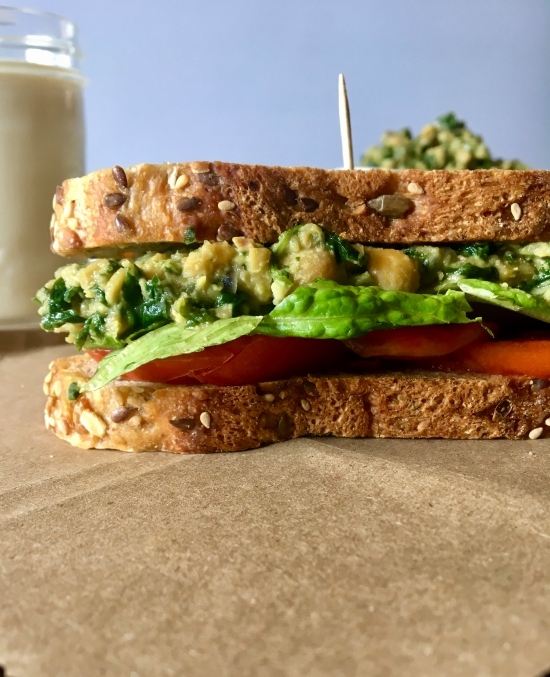 This creamy chickpea mash with spinach is GREAT on sandwiches, and we would suggest pairing it with air-fried white or sweet potatoes and a glass of soy milk – pre-school style. 😎 *swoon* In this recipe, I mixed the cream sauce with the mash, but feel free to drizzle on top or use it as a sandwich spread. 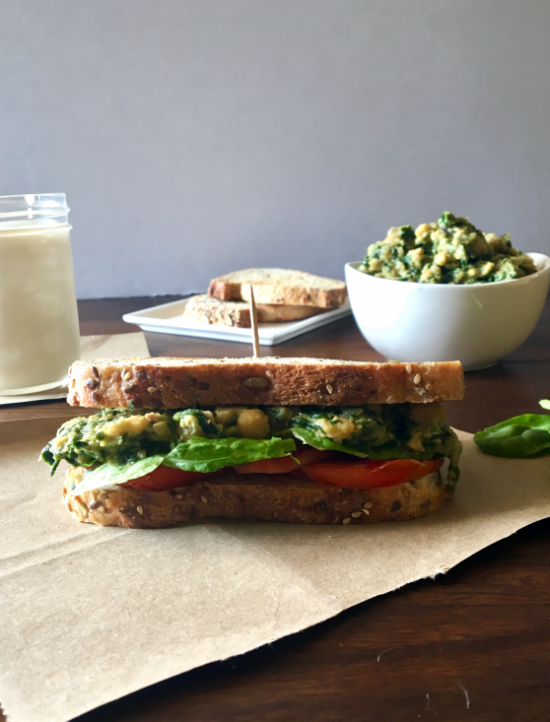 This creamy chickpea mash with spinach is such a killer option for a packed work or school sandwich. It's healthy too and can be meal prepped in advance! Heat your oil over medium-high heat in a large pan. Add the garlic, onion, and a pinch of salt and saute for about 3 - 5 minutes or until translucent. Add the chopped spinach and stir to coat. Stir in the chickpeas and cook for 4 minutes, covered. While that's cooking, make the avocado sauce: Add all ingredients to your blender or food processor and blend until smooth. Use a potato masher or a large wooden spoon to mash the chickpeas and stir in the avocado cream sauce. Enjoy this on a sandwich, wrapped in a tortilla, or just right out of the bowl! Wow this dish looks so delicious. I am going to try it soon. Thanks love!